We’re in the midst of a national conversation about privacy rights in a digital age. 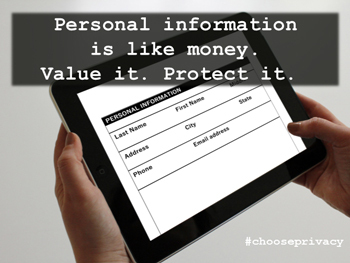 Our Choose Privacy slideshow offers helpful tips to help you protect your privacy while online. Check and Update Your Privacy Settings: use direct links to update your privacy settings on popular devices and online services. Our Help Desk technicians can answer questions you have regarding privacy settings on your devices. Make an appointment or walk in during Help Desk hours at your favorite branch. Choose Privacy Week: take action to defend your online privacy with practical privacy practices recommended by the American Library Association. FTC Complaint Assistant: learn about common scams and rip-offs. FTC Online Tracking: get answers to commonly asked questions about online tracking — how it works and how you can control it. FTC Keeping Personal Information Secure: understand how to protect your personal information, which can help you reduce the risk of identity theft. IdentityTheft.Gov: report identity theft, get a recovery plan, and put it into action. Stay Safe Online: learn how to keep your devices clean and protect your personal information. The website includes tips for parents on cyberbullying and parental controls. Stop | Think | Connect: find tips and advice on keeping the web a safer place for everyone.